Daniel J. Edelman, who founded an agency that would go on to become the PR industry's biggest, died Tuesday at age 92 of heart failure. 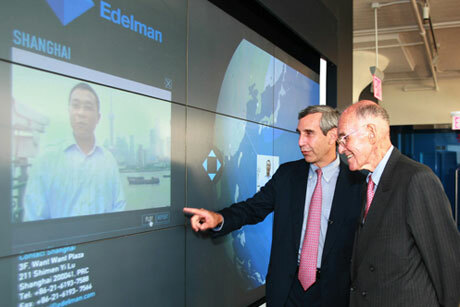 Edelman, who remained the eponymous agency's chairman late into his life, founded Edelman in 1952 in Chicago. He previously worked as a reporter in Poughkeepsie, NY, before he was drafted into World War II. Edelman also worked as a newswriter for CBS and as PR director for hair products-maker the Toni Company before founding his own agency. He retired as chief executive in 1996. During his time at Toni, Edelman was credited for creating a groundbreaking media tour to promote the company's beauty kit, utilizing the then-nascent medium of TV in the process. The firm's early clients included the Toni Company, Sara Lee, Brunswick Bowling, Paper Mate, and ReaLemon. It opened offices in New York, Los Angeles, London, and Washington in the 1960s as it diversified its client base from consumer marketing into healthcare, public affairs, technology, and crisis management. Long-term clients have included Heinz, Butterball, Microsoft, and Samsung. The firm's revenue totalled more than $600 million (£374 million) in 2011, not including sister agency Zeno Group. Its current clients include Microsoft, Pfizer, General Electric, Walmart, Abbott Laboratories, Samsung, Royal Dutch Shell, Kraft, Johnson & Johnson, and Unilever. Daniel J. Edelman Inc. also includes subsidiaries Blue, Edelman Berland, Ruth, DJE Science, Matter, First&42nd, and Edelman Consulting. Edelman, who was born in New York City in 1920, is survived by his wife, Ruth; a daughter, Renee; sons Richard and John; and granddaughters Margot, Tory, and Amanda. Richard Edelman is the eponymous firm's global chief executive, while Renee Edelman is an SVP, and John Edelman is MD of its global engagement and CSR initiative.